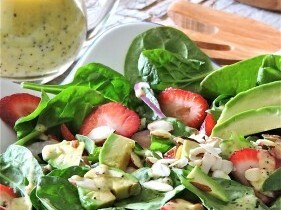 We often blend spinach, avocados and strawberries in our healthy morning smoothies, and that inspired us to create this beautiful, simple, summer spinach salad. To make the dressing, add all dressing ingredients EXCEPT poppy seeds (or chia seeds) to a blender and whirl until emulsified. A small, Magic Bullet-type blender works great for this purpose. Stir in poppy seeds or chia seeds and refrigerate for at least 1 hour before serving. Give dressing a good stir or shake before using. Note: You will not use all the dressing. Keep leftover dressing refrigerated for up to 3 days. Place salad ingredients in a large bowl. Add 1/3 of the dressing and mix gently with tongs, being careful not to squish the avocado. Add more dressing if needed and serve immediately. Top with crumbled feta cheese, if desired. Cooking Tip: Using black chia seeds will help thicken the dressing (slightly) as it chills in the fridge. Topping the salad with sliced, grilled chicken makes it a filling summertime meal.